This vegetable is widely popular throughout the world and is readily available in supermarkets year round with hundreds of varieties to choose from. Iceberg used to dominate the selections but other varieties are now moving to the forefront. Most domestic varieties are from California and imported lettuce typically arrives from Europe. Most dark greens are good sources of Vitamin C, beta-carotene, iron, calcium, folate, and dietary fiber. The rule of thumb is, usually, the darker the greens, the more nutritious the leaf. Spread light mayo on buns, then sprinkle pepper. Add ham, cheese, lettuce, baby dill and french onion fries. Enjoy! I try to eat as many greens as possible each day. For a splurge when I get a sub, I normally go for the chicken parm, which of course as no green whatsoever. Well I'm so glad they didn't throw those weeds out. 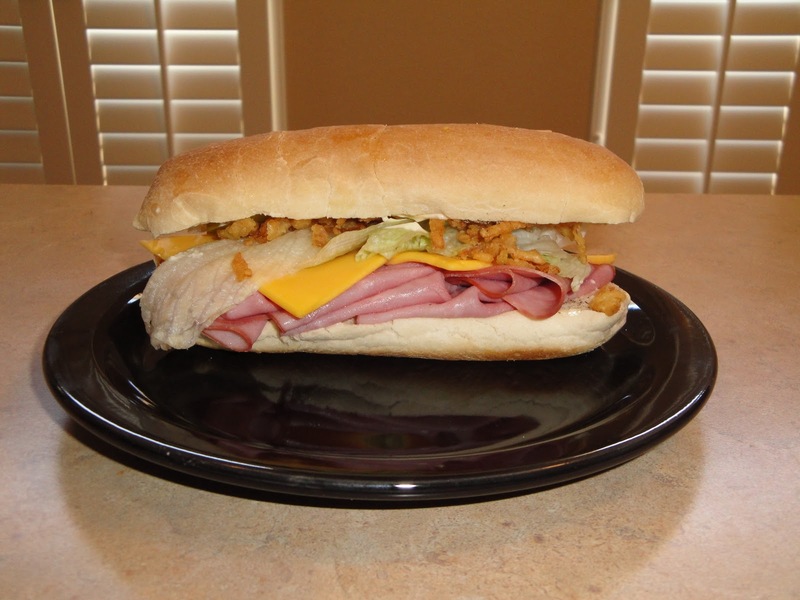 That is one tasty looking sub. Hope you have a great weekend, we have rain headed our way. Lettus as weed! Wow that's very interesting. I always learn something new by reading your post. I love your sub! I love lettuces, salads...AND sub sandwiches! Nice ingredients here,especially the touch with the french onion rings. So when are we meeting for lunch...don't forget to bring these sandwiches! Great sub! I also appreciate the historical backgrounder, gives me a fuller picture. Thanks! This sub looks very appetizing! Thanks for sharing tips your thoughts about lettuce. When I buy lettuce (my fave would be Romaine), I just get what my husband and I can consume for a day or two to ensure we're eating them fresh. Interesting lettuce facts. I'm a huge fan of the lunch sandwich, yours looks great. Mmmm! Lettuce or not, this is the kind of thing I would like to get my mouth around indeed! My! This certainly is a lot of delicious meat to cram onto one bun! yum. hi Christine, I love lettuces and the salad family including romaine and endives. Here in Malaysia, ours are 90% imported, I wish we can buy them with roots ,so that I can keep them in water and last longer..
thanks for their great health benefits . Imagine they were discarded as weeds- wow ! our diet changes a lot over generations. Thanks for the great info! Your sub looks yummy! I eat lettuce at least once a day, and I appreciate your storage tips. Interesting tips on storing salad greens! I love sandwiches...so keeping this recipe. Yum! what a nice outcome Christine, lettuce is one of my fav one at home because I don't need to cook it and its an easy veg to be eaten with rice or made as salad. I make almost this exact sandwich for my husband every day for lunch when he goes to work. Once again, a very informative post! Great Lettuce facts and history Chritine and great sandwich as well. Very informative post on lettuce, Christine...and I must say, your sub looks great - so healthy and filling! Thanks for all the comments... love them. Who knew there was so much info out there about lettuce...great looking sandwich. Looks like a great sub! I finally got used to dark leafy green lettuce and it's hard for me to turn back now. Your sandwich is huge and so filling. The guys in my family would devour a sammi like this in a heartbeat. I am not a big sandwich person when it comes to plain white bread though I get in the mood sometimes but I DO love a good sub and this looks like a good one! Great sub. I actually worked in a sub place as a teenager. Then my son did when he was teenager. Subs are great for lunch or dinner. Love yours. Huge fan of quick and healthy! The Spring greens are all so sweet and tasty here at the moment. Greens are also a fab way of getting iron if you don't eat red meat. The darker the leaf, the more iron.